As the days have grown shorter and the trails have grown soggier, I’ve been logging quite a bit of miles in the Altra Lone Peak Polartec Neoshell. The Lone Peak Polartec is Altra’s first entry into the waterproof lineup of trail footwear. Many companies on the market have full lineups of winter and wet weather options using protective liners like Gore-Tex, Outdry, and Clima-Shield. This was always a point of consternation for Altra wearers, as there really aren’t any options with zero drop and a wide toebox, Altra’s hallmark. They’ve remedied this with the Lone Peak Neoshell, which will come as sweet relief to many. I’ve had a chance to put the Lone Peak Neoshells to the test over the last month and half, and below you’ll find my impressions. The Lone Peak Neoshell is built on the same last as the Lone Peak 2.0 and not the newer 2.5 model. The outsole and midsole of the 2.5 and 2.0 are nearly identical, but it’s the upper that has made the biggest change. Keep that in mind when ordering these, as I found the 2.0 to fit a littler larger than the 2.5. In the 2.5, a size 12.5 fits me just right, with just enough space in the toe box for room on steep descents. The Lone Peak 2.0 fits a little bit larger, and I can get away with wearing a size 12. I opted for the 12.5 in the Lone Peak Neoshell, as I knew I’d be wearing them with thick socks for cold and wet weather. Still, I probably would have been okay with a 12, as Altra’s footshaped toebox means you don’t have to size up like most trail shoes require. The rest of the Lone Peak Neoshell fits just like the Lone Peak 2.0. with a little less internal volume due to the liner being used. I find this shoe to be very comfortable, with no hotspots or rubbing. The weight of Neoshell is listed at 11.4 for a size 9, which is about the same as the 2.0. The Lone Peak 2.5 dropped to 10.1 for the same size, so this model is quite a bit heavier than the 2.5. The claim above is what had me most excited about the Neoshell. Most hikers and runners don’t wear waterproof liners because of the breathability issue. The liners do a great job of keeping moisture out, but they also tend to do a great job of keeping sweat and warmth in. Not always a good thing when you’re hiking or trail running. Compared to a few Gore-tex(GTX) lined shoes I’ve used in the past, the Lone Peak Neoshell did seem to breath quite a bit better. I’m not sure if this is due to the Neoshell or the design of the shoe, where Altra decided not to incorporate the liner into the tongue. I’ve read a few complaints of this shoe not having the Neoshell on the tongue as well, but I didn’t find it to be that much of a problem, when I did some creek crossing tests and some hiking in deeper snow. For a prolonged downpour, gaiters would definitely be necessary, but this is why I don’t think a lined tongue is all that valuable: If you’re in a downpour or crossing deep water, the water will get in over the ankle of the shoe anyway if you’re not wearing a gaiter. With the tongue not being lined, it allows the shoe to dry a little faster, and keep your feet cooler when you’re not in heavy water logged conditions. I know a few may disagree with me on this, but as a Southern California resident who doesn’t get a ton of rain, the non lined tongue makes a lot of sense. These aren’t the kind of shoes to take flying through bogs, deep mud, or torrential downpours, but some would argue (me included) that you don’t want any waterproof liner in these conditions. Drainability is key when you know you’re going to get wet. What the Lone Peak Neoshell does do well is keeping out the unexpected and unwanted surprise, and they keep snow from melting and soaking through your shoe and sock. I also found that the Neoshell does a great job with sand. I know this isn’t what they’re designed for, but I did a lot of sandy hiking in Utah over Thanksgiving break and the protective Neoshell was a godsend at keeping my feet from the nasty chaffing I usually get on sandy trails. The Neoshell upper gives the shoe a bit of a crinkly feel, and it isn’t nearly as supple as the 2.0 or 2.5. Just like all Altra trail shoes, the Lone Peak Neoshell comes with the Gaiter Trap on the heel, for a quick and easy way to attack Velco based gaiter systems. The tongue on this shoe is gusseted and does a great job of keeping out dirt and debris. One of the biggest differences between the Lone Peak 2.0 and the Neoshell on the upper is the toe guard. The toe guard is a little thicker and comes back a little further on the toebox to help keep out unwated moisture. I really liked it, but it took one or two wears to get used to, as the vertical volume in the toebox didn’t seem to be as cavernous. I actually prefer the precise fit, and hope future Altra’s have this same feel. The Lone Peak Neoshell is a zero drop shoe with a 20mm stack height in both the heel and forefoot (all Altras are 0 drop). Altra uses a Sandwiched StoneGuard rockplate for push through protection. What makes this different from other rock plates found in trail shoes is that Altra places the protection between the A-bound and EVA layers of foam, where other companies place the stone guard closer to the outsole. This allows the shoe to absorb some of the impact before deflecting it. The Midsole on the Lone Peak Neoshell rides really nice on just about every surface. I took this on snow, ice, asphalt, rock, dirt, wood, and sand. My feet felt comfortable and responsive over all surfaces. For the outsole of the Lone Peak Neoshell Altra is once again using their Trail Claw tread pattern. Trail Claw is composed of a series of chevrons down the middle of the foot and in the forefoot, and x shaped lugs along the perimeter of the midfoot. I found this pattern to work great on all sorts of trail conditions. I also found that the rubber on the Lone Peak Neoshell was a little more grippy than that of the Lone Peak 2.0. The only time I felt like I was on skates, was when I did an early morning hike in Bryce Canyon where it was 7 degrees outside and I was on a lot of ice. Not too many shoes handle those conditions without any slipping. I had some serious durability issues with the outsole of the Lone Peak 2.0, and a little with the 2.5. I hike on a ton of rocky trails that are unkind to all but the toughest outsole. The outsole for the Neoshells have been largely spared due to the nature of winter trails that cover the sharp rocks with mud, ice, snow, and leaves. The few times I have taken them out on the super rocky stuff, they began to show the wear that comes along with it. I’ll keep hitting the trail with these well into the Spring, and provide an update on durability. The Lone Peak Neoshell retails at $150. 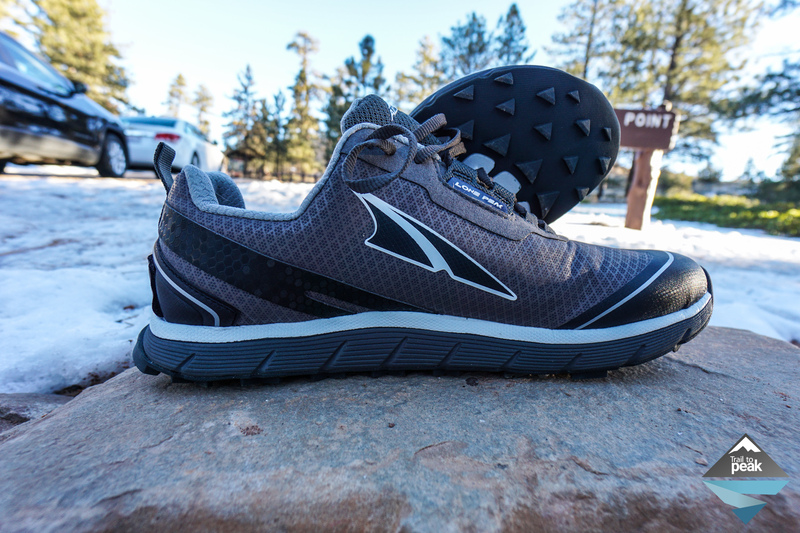 For fans of Altra shoes, there is a lot to love about the Neoshell. The zero drop, wide toebox, and overall comfort will be met with open arms for those that have had to look to other brands in the past for a waterproof winter option. On the other hand, the lower height toe box, might come as an unwelcome surprise to some. I wish this shoe would have been based on the newer Lone Peak 2.5, as the fit and form factor have been drastically improved by Altra from the 2.0 to the 2.5. The waterproof Neoshell liner does a great job in a wide range of conditions, especially for a trail shoe, and breathes well compared to other waterproof shoes in the market. Some may find the non lined tongue to be a problem, but that can be remedied with a gaiter. In closing, this shoe is a great option for those looking to find a zero drop, wide toe box, waterproof trail runner or hiker. If you’re a fan of Altra, give this shoe a try.